It’s a Little Dot that leaves a big dent in the wallet 🙂 Running for the next four days and change at Massdrop is a sale on new condition Little Dot Mark III headphone amps. The base edition goes for $200, while the SE (Special Edition) goes for $460. They have two input tubes and two output tubes. It may be a little dot but it’s not a little price 😉 Running for the next two days and change (from blog posting date), Massdrop is offering once again the new condition Little Dot MK III Tube amp for $230 with free shipping and an end of April shipping estimate. It will ship from Massdrop with all sales final. On the same listing, they offer the SE (Special Edition; balanced, more power) for twice the price. They may call it a “Little Dot” but it is certainly larger than a dot 🙂 The new condition Little Dot MKII Tube Headphone Amp is back on again, fully unlocked at members-only but free-to-join Massdrop for $135 with free US shipping. The offer is running for the next four days and change (from blog-posting date) and offers additional tube options for additional cost in the shopping cart. They will ship from Massdrop in early May 2018 with all sales final as usual (I’m not sure if I should repeat this in every post since this is how Massdrop does business). There is no mention of warranty in the listing. I fell behind on Massdrop updates, thus the avalanche of Massdrop posts. Good for the next one day and a few hours (as of the time of writing; unfortunately MD does not post a specific countdown until the clock is under 24 hours) is the new condition Little Dot MK II Tube Headphone Amp offered for $130 with free shipping. There are options for other tubes for additional cost. These will be shipped by Massdrop in early January 2018 and all sales are final. There is no mention of warranty in the listings. If you want to get the new condition Little Dot MK II Tube Headphone Amp without the risk of buying from an unknown Chinese seller, Massdrop has an alternative for you! It is currently offered there, fully unlocked, for $130 with free shipping. They will ship from Massdrop in early December 2017. In the shopping cart, you have options two additional tubes for an extra fee of course. The offer (“Drop” in MassDrop speak) ends in four days from blog-posting date. PS: “fully unlocked” in MassDrop-speak means that’s the lowest price the item is offered as part of the current Massdrop promotion. It’s a different way of pricing things. The previously mentioned Little Dot Sale at NewEgg FLASH is now under way! A total of six models are participating, with prices ranging from $2800 to $600. These are sold by Shenzhen Audio and will ship free from China. The sale ends Thursday night (7/27/17). 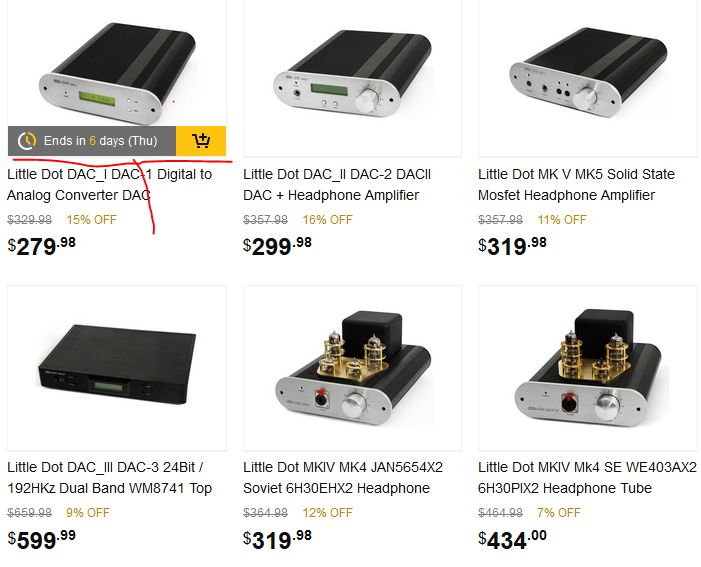 If you are a fan of the Little Dot headphone amps, half a dozen of them are scheduled to go on sale on Friday either at 5am ET or 12pm ET at NewEgg FLASH. Some will go live at 5am ET, others at 12pm ET. The actual start time over there may get readjusted slightly. For example, the previously mentioned Audio Technica ATH-AD*X sale shifted to later in the day. Another offer is now fully unlocked at the members-only Massdrop, the Little Dot MKII Tube Headphone Amp is going for $120 plus shipping. The offer runs for the next seven days and will ship in early June 2017. As usual with MD’s offers, all sales are final, which is one of the reasons they can offer lower prices. You can optionally upgrade the tubes for $more$. This device is larger than an actual dot 🙂 The Little Dot MKII Tube Headphone Amp is currently offered at members-only but free to join Massdrop for $115 plus $9~ flat shipping. This is the base configuration with 6JI tubes included. Two more options are available for $more$. They ship and are warranted by Massdrop actual, with a late March 2017 shipment estimate. The offer runs for the next six days (from blog-posting date – give or take). Also unlocked there, but the price difference is not as big versus instant gratification, the FiiO E10K USB DAC/amp goes for $65 plus $3.50 flat shipping with a late March 2017 shipment estimate. But if you want it yesterday, multiple Prime eligible sellers offer it for $76. Or you can get it in “Used – Like New” condition (all accessories, original packaging) for $64 with free shipping by ProStudio through Amazon Warehouse Deals (not Prime eligible). It’s tubes, but not tubular bells at Massdrop, where the Little Dot MK II tube headphone-amp is now fully unlocked, going for $120 plus $9~ flat shipping. The offer has seven days left (from blog-posting date) and the shipping estimate is early November. MD is offering a 1-year warranty on this. During checkout you have the option to upgrade the tubes to more expensive models. Another day, yet another offer is currently fully-unlocked at the members-only Massdrop shopping club (free to join though). It is the Little Dot I+ Headphone Amp going for $90 plus $9~ flat shipping. This has seven days to go (from today = blog-posting date) and it is estimated to ship in early November 2016, so patience is an audiophile virtue 🙂 It comes with a 1-year manufacturer warranty. This is a tuby amp-only, as it is visually hinted by the inputs and outputs. Optionally at checkout there are two options for tube upgrades for +$13 or +$28. Another day, another unlocked offer at members-only Massdrop, this time it is the Little Dot MKII Tube Headphone Amp going for $120 plus $9~ flat shipping. Additional tube choices are available when during the checkout process over there. There are seven days (from blog-posting date) left in the offer and the shipping estimate is late September 2016. It comes with a 1-year warranty from Massdrop itself. If you are eyeing the dots, and dotting the Is, the Little Dot I+ Headphone Amp is currently fully unlocked at members-only Massdrop for $90 plus $9~ flat shipping. Offer is good for the next seven days and will ship late September 2016. A couple of tube upgrade options are available at checkout for additional cost. This is a simple amp, RCA audio input and headphone out. No other input/output options. The AKG K7XX Massdrop Limited Edition headphones (open-back over-ears) are back at members-only Massdrop, offered for $200 with free shipping, with seven days to go (from blog-posting date). This offer has 1250 units available. As of the time of writing, over 1000 units are still available. The K7XX (actual product name, not X as a wildcard) is based upon the K702 65th anniversary edition, fine-tuned by Massdropophiles. More offers got added to Massdrop, with the ones mentioned here ending in 6-7 days from blog-posting date. One of them is fully unlocked, the Etymotic Research ER-20 Earplugs for $11 with free shipping. These are just earplugs, not earphones! This is limited to 100 units and 81 have been purchased as of the time of writing.